To many U.S. Latinos, they are much more than figurines in the Nativity mangers under our Christmas trees. They are Melchor, Gaspar and Balthazar, those three magical figures who rode camels and left toys under our beds every Jan. 6 when we were kids. They are the same three wise men who brought gifts to the Baby Jesus in Bethlehem, according to the Bible, on the 12th day of Christmas. And they still come around to visit many Hispanic homes — yes, even after we immigrate to the United States — when we remember to invite them! In Spanish: Feliz Día de Reyes! After all, most foreign-born U.S. Latinos grew up receiving gifts not from Santa Claus on Christmas Day, but from Los Tres Reyes Magos on Jan. 6 — the day Catholics celebrate the Feast of the Epiphany. It's a wonderful tradition that came to the New World — including current U.S. territory — with the Spanish conquistadors. The first Christmas and Three Kings Day in North America were celebrated in 1539-40 by Hernando De Soto, 12 Catholic priests and some 600 conquistadors, who had camped for the winter in an abandoned Native American village in northern Florida that later would be called Tallahassee. Those of us who still cherish that tradition and want to pass it on to our children have been fighting an uphill battle in this country for many years. We host some Three Kings Day festivities and try to keep the tradition alive in some homes. But Santa's popularity has been overpowering. U.S. Latinos often are (unfairly) accused of being reluctant to assimilate in U.S. society, yet this is one example of how fast assimilation actually is occurring. The speed with which some of us pick up Santa and drop the three wise men is, frankly, shameful. This is our own holiday for Hispanic children, and those who value our heritage should refuse to let it fade into oblivion. Of course, Santa also should be welcome in our homes, but not at the expense of our own precious holiday. Instead of allowing Santa to give away all the presents, surely we can ask him to set some aside for the three wise men. For the Latin American child that is still alive in many adult U.S. Latinos, this should be the time to dig out the roots of our culture and pass our traditions to younger generations. Just as we teach our children that there is a Santa Claus capable of flying on a sleigh, surely we can explain — as our parents did with us — that worldwide overnight toy delivery also can be accomplished by three kings riding on camels. By maintaining the Three Kings Day tradition — through religious observances, musical concerts, toy drives and even a children's parade featuring three wise men riding camels through the streets of Manhattan — some Latino parents have been able to instill ethnic pride in their children at a very young age. Having their own Latino holiday gets children started in observing the traditions of their ancestors. But let's face it; Three Kings Day is not an American holiday. Government offices will not close; banks will be open; schools will be in session; and not many stores will be having special sales. In spite of the rapidly growing purchasing power of the U.S. Latino population, unfortunately toy retailers in this country have yet to realize that Three Kings Day is a gold mine waiting to be discovered. Some don't even realize why so many U.S. Latinos are out shopping for toys for several days after Christmas has passed! Ironically, while Santa often is over-commercialized and the true meaning of Christmas often gets diluted, the three wise men could use a little more commercialization to ensure the survival of one of our most precious Christian traditions. Even in Latin America — where, thanks to the influence of the U.S. media, Santa's popularity has increased dramatically in the past few decades — many people are complaining that old St. Nicholas is replacing the three figures and the Christmas story that has a biblical foundation. On the Internet, some leftist extremists, unable to contain their anti-American sentiments, have turned on Santa Claus, calling him an "impostor" who represents "cultural colonialism." They say the media are trying to impose "a foreign cultural figure" to replace the Hispanic three wise men tradition, and they have built many websites and Facebook pages to express their bitterness and anger. But there are many others — an overwhelming majority, of course — who reject such cheap politics and refuse to choose between magical figures who come bearing gifts. They are using social networking sites to write moving testimonials, recalling some of the best times of their lives — brought to them by both Santa and the three wise men. 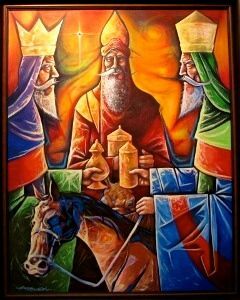 Published at Creators.com - Happy Three Kings Day! - on January 4, 2011. My 2001 Letter to the Reyes Magos of My Youth . . .